This is a beautifully written book. Take a broken married couple who wanted nothing more in their life than to have a houseful of children and place them in Alaska during the 1920’s. Mabel and Jack moved to the wilds, away from their families, to a homestead so remote the closest town doesn’t have a doctor. This is their chance to start over, where it is just the two of them, away from family that judged their failure to have children. Their life in Alaska shows two shadows of people growing outside of themselves to trust each other again, befriend a new family of chosen friends, and raise a young mysterious and wild girl of the woods. 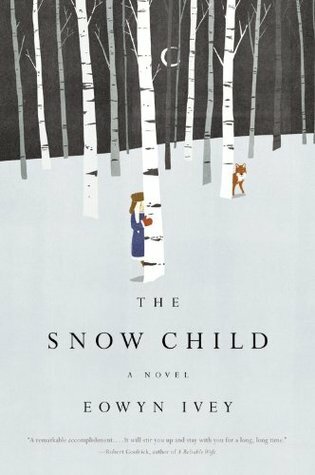 ‘The Snow Child’ is linked to the Russian fairy tale, ‘Snegurochka.’ The beauty of Ivey’s story is that her characters, or at least Mabel, is aware of the fairy tale. What would you do if your deepest dreams came true in the likeness of a story you were told when you were a child? Would you believe it? The more I think about this book the more I like it. At the beginning, Mabel and Jack are estranged. They purposefully have chosen to not interact with other settlers. They are protective of their sadness. Their move was made to get away from other people and to be able to create a homestead and life that is theirs. As they grow through the book their peace of mind and happiness comes from their closest neighbors befriending them forcefully. Mabel’s polite cultured upbringing is no match for Esther’s loving refusal of any form of convention. This stubbornness is what breaks Jack’s and Mabel’s defenses to be able to care, love, laugh, and learn of their own strength. This is one piece of the book. The second is a mysterious little girl. One evening, in the dead of the long Alaskan winter, a young girl appears at their homestead. They don’t see her, but there is evidence of her. Mabel and Jack built a small and beautiful snow child during the storm. It was an image of the child they yearned for. They dressed it in scarf and mittens knowing that there was no person in miles to claim the items during the night. In the morning the articles are gone. Jack follows tracks away from the statue but can not find the items. Both he and Mabel think they see signs of a little girl but for a long time they think it could be the tricks of winter and cabin fever playing with their minds. Eventually, the child reveals herself to them. The child, supposedly, is the daughter of a trapper who has died. She refuses to live with them and will only visit them if they do not restrict her movements or force her to stay. She takes care of herself. No one has seen this child other than Mabel and Jack. Their friends are kind but do not believe she exists. Mabel remember the tale of “the snow child” from a Russian story book her father read her and starts to believe the little girl is ‘Snegurochka.’ It fits. Faina, the girl, disappears during the summer. She only sees Mabel and Jack in the winter – disappearing when the snow melts. Mabel has her sister send her the book. She wants to know more about the tale. What does it mean and what happened to Faina – the girl she loves as her own daughter? If she has enough faith will she come back with the snow? Ivey is a skilled writer. She evokes the solitude and wild nature of the early Alaskan frontier. The beauty of the landscape combined with her strong complex characters alone make the book worth reading. Add in the magical realism of the fairy tale and you get something very special. To be clear, the magical realism is a question. It is not clear if Faina is ‘Snegurochka.’ Much of the story is dedicated to Jack and Mabel determining if she is in fact real or a figment of their imagination brought on by the duress of the Alaskan winter. The other question is if she is akin to a feral child or if she is something more magical in nature. Ivey explores the definition of magic, family, strength, and trust. This book snuck up on me. I didn’t expect to love it as I do. I continue to think about it long after I finished it. It is not action oriented. Do not pick this up if you are in the mood for that. It’s strength lies in being a contemplative book of ideas and character study. If you enjoy audible books Debra Monk does a beautiful narration. I highly recommend it. Her performance added to the enjoyment of the experience. This book is one I prefer to listen to than read. This is historical fiction and a fairy tale retelling. 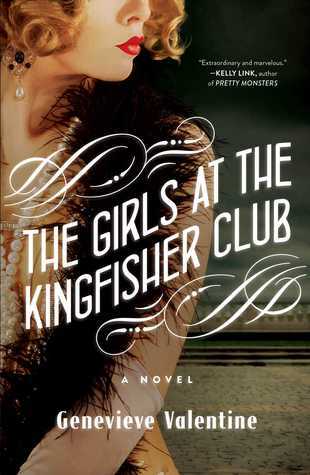 Combine the prohibition era with ‘The Twelve Dancing Princesses’ and you get ‘The Girls at the Kingfisher Club.’ The roaring twenties is a perfect setting for this Grimm fairy tale. The reality of restriction and prohibition in the society of day leading to an overwhelming majority of citizens rebelling by drinking at the speakeasy’s at night. Politicians and policemen frequented the speakeasy’s while their political platforms railed against corruption and the vice of drink. Bootlegging alcohol across state lines was a booming trade, and the speakeasy that got raided was the one that didn’t pay protection or a bribe. Now, add the state of women’s rights. Previous to 1920 American women did not have the right to vote, and married women couldn’t own property. They had no legal claim to money they earned, and were subject to the will of their husband, father, or nearest male relative. What better setting could you place a story about twelve princesses tightly controlled by their father who somehow wear out their shoes every night? This type of traditional father would never allow his daughters to go dancing. In his eyes, only disobedient lascivious women would engage in lewd behavior as dancing and drinking, and only a weak man can’t control his women. Mr. Hamilton is nouveau riche. He married a woman of status. Being a driven and ambitious man he knew that if he had a son he could enter the upper echelons of society. His wife, however, only had daughters. Mrs. Hamilton was never without child until she died. She conceived and birthed twelve daughters. Her twelve daughters rarely got to see her and were confined to the upstairs rooms. Only Josephine, the eldest was announced. None of the daughters were introduced to society and most never met their father. Only two were ever let outside the house at a time with a nanny. They had a governesses but as more daughters were born their father dismissed her deciding that the girls were Josephine and the eldest girls responsibility to educate and care for. Precious rare occasions took place when Josephine was taken to a movie or the opera as a special treat arranged by their mother. It had to be and hidden from their father. There were a few books and sporadic presents at Christmas time when their father was feeling generous but otherwise the were to stay away from windows, not be seen, and be forgotten. Josephine or Jo was their father’s emissary. She negotiated a $4 allowance once a month to buy clothing, shoes and any large concerns. Jo learned early not to anger their father for fear of abuse and what consequence it would have for her sisters. Several time she sent her sister Ella, the actress, to play the role of a foolish and demure young woman to obtain needs rather than go herself. She was factual tempted to challenge – something that guaranteed refusal from their father. The escape from their cage is dancing. Over years Jo’s responsibility makes her seem like the nannies, and found she could escape with one of the girls for a few hours. They went to the movies, saw dancing, and fell in love. They practiced and made up steps until they grew the nerve for the oldest to leave, grab a cab, and go to the first club they heard of. They danced all night, but their were rules. You couldn’t go if you were sick, if you were heart-sick, you could tell no one names or where they lived, if you got drunk you would be left, and they went home on Jo’s orders. Over time they became know only as the princesses. They got a reputation for having tin hearts because they didn’t dance for romance. Also, the princesses stuck together, if someone got handsy they had all the princesses to contend with. Their father decides its time for them to marry and creates heartache and fear. It isn’t that the girls don’t want to marry. The concern is for the kind of man their father will pick for them. No introduction to society is planned. They are still a secret. Instead a few girls at a time will host quiet dinner parties with men their father deems suitable. Considering their fathers controlling and traditional values the sisters don’t have much hope for nice open-minded men. What kind of man would want a woman who had been closeted away and knows nothing of the world. This is a beautiful retelling. Valentine turned a tale about misbehaving cold-hearted young women on its head. It shows controlled, captive women struggling to find independence during the twenties when women just received the vote. Many women were breaking out of the sole role of being at home as mother and housekeeper. The story shows their need to be cold. Solidarity for the sisters was a necessity of survival. Valentine’s writing is beautiful, but I found I didn’t have the time to read as much as I wanted. When I saw it was available on audible I snapped it up. It’s a fabulous way to enjoy the book. Susie Berneis is the narrator. I had read some critique of minimal character development of the sisters outside of Joe. Listening to Susie Berneis I didn’t notice it as much. There are a few sisters who definitely do not get as much attention, but the narration made it feel natural. This is not a romance but does deal with gender roles and the dynamics in dating and marriage during the era. A few kisses are discussed perfunctorily, but nothing in any kind of detail. I recommend this to anyone who enjoys the roaring twenties, fairy tale retelling, The Twelve Dancing Princesses, and the study of social dynamics during Prohibition in the twenties. Listen to this rather than reading it if you enjoy audible books.